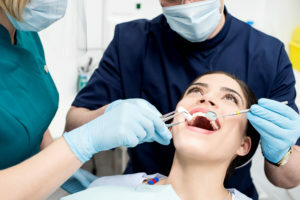 This term refers to a recent discovery that has formed a bridge between doctors and dentists, where correlations have been found between dental and overall health. The oral systematic connection paradigm is based on research that shows how your mouth acts as the window to the health of the rest of your body. The common denominator, whether considering oral or overall health, is blood. It flows throughout the body and carries the traits of one part to another. That means that if there is infection in the mouth, then the blood that permeates the gums will carry traces of the illness to the other parts of the body that it travels to. For those who are neglectful of their oral health, one of the most common realities is the development of gum (periodontal) disease. It causes inflammation, irritation, swelling and bleeding of the gums and results from the accumulation of plaque that has seeped beneath the gumline. Heart Disease – The inflamed blood that travels from your mouth down to your heart can contribute to blocking your arteries, which inhibits the flow of oxygen. This can cause a stroke or heart attack if not treated soon enough. Pancreatic Cancer – The bacteria and plaque associated with gum disease can also contribute to developing pancreatic cancer. Researchers have found traces of carcinogenic compounds in the mouths of people suffering from acute gum disease and evidence of the same among people who have pancreatic cancer. Alzheimer’s Disease – Not only does infected blood leave the mouth and flow downward; it can also travel to the brain. Just as bacteria cause inflammation in the gums, they do the same in the brain. As a result, the chances of developing Alzheimer’s disease increases. The two main ways of preventing bacteria growth are to practice excellent oral hygiene, which includes brushing and flossing your teeth twice daily, and visiting your dentist in Mansfield semi-annually. These appointments will leave you with a clean oral cavity and the assurance of knowing the status of your oral health, as your dentist will thoroughly examine your mouth, teeth and gums. So to take a proactive step in the right direction, reach out to your local dentist to schedule your preventive care visit today. Dr. Sandi L. Hamm earned her DDS degree from Baylor College of Dentistry and has been enhancing the oral health of patients in the Dallas-Fort Worth area for two decades. Still eager to learn more, she pursues continuing education courses annually and maintains membership in several professional organizations. Dr. Hamm can be reached for more information through her website.